The Monkey Puzzle tree (Araucaria araucana) is a distinctive, almost symmetrical looking tree with sharply pointed, leathery leaves (don't touch them without tough gloves on - we speak from experience!). This unique evergreen coniferous tree was given its common name ‘Monkey-puzzle’ when it was suggested that it would puzzle a monkey to climb it. Araucaria araucana is very slow growing and will reach just 6 x 4 metres in 20 years creating a pyramidal shape. 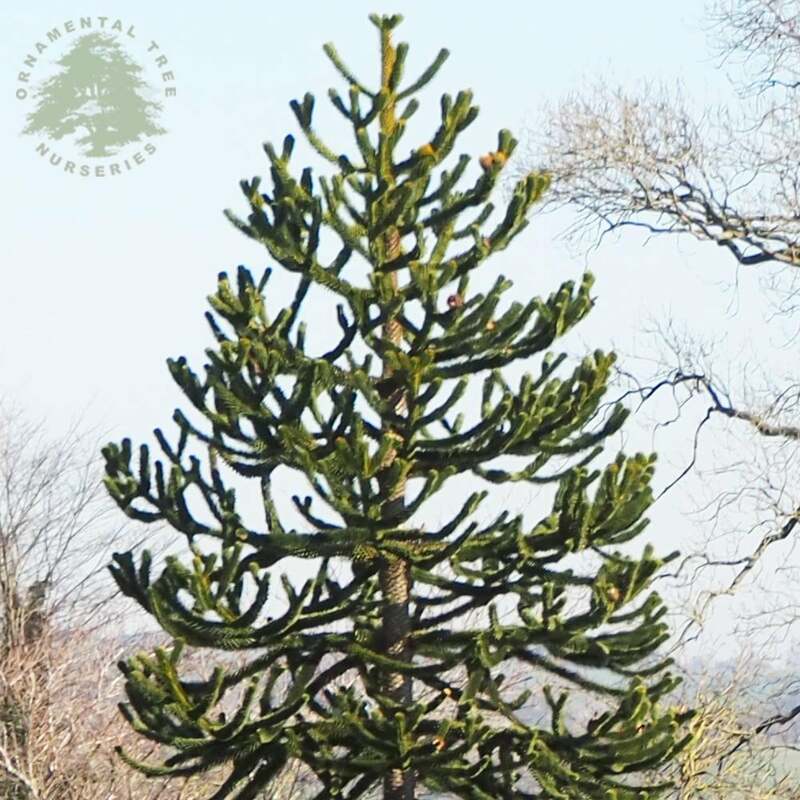 The leaves are so long lasting that sometimes the same leaf is held on the tree for 10 years or more Due to its eventual size, Monkey Puzzle trees are best suited to medium or larger gardens as a specimen tree. Extremely hardy and tolerant of even exposed coastal positions this tree will do well in any well drained soil in sun or part shade. Female cones release edible nut like seeds (like large pine nuts) and is a food crop in Chile, although trees do not produce nut crops until mature (maybe 30 years old). Originating in central/southern Chile and western Argentina, this tree is also sometimes known as Chilean Pine (originally named Pinus araucana after the native Chileans who used the nuts as a main component of their diet). Interesting facts: the first saplings were brought to the UK in 1795 - the seeds were served as a dessert at a dinner hosted by the Governor of Chile and instead of eating them, Archibald Menzies a plant collector, planted them on the ship, Discovery, and by the time the ship returned to the UK, the saplings were ready to be planted out at Kew Gardens. Our pot grown Monkey Puzzle trees can be planted at any time of the year. Start by removing all weeds and grass within a metre of your desired planting hole. Dig a square hole as deep as your root mass and approximately 2x as wide. To help Monkey Puzzle tree establish more effectively, we advise applying root grow by sprinkling in the hole in the hole for pot grown trees. Gently loosen the tree roots and place into the planting hole. Mix 50% of the original soil with 50% high quality compost, fill in the hole and firm around gently. Avoid banking soil up around the collar of the tree as this can cause problems. We advise planting young Monkey Puzzle trees with a stake and tie kit. To see how to use a tree stake and tie, watch our informational how to videos. If you’re planting Monkey Puzzle in spring or summer, water well and regularly for the first few months. Keep an eye on young trees and increase watering if there are extended periods of hot or dry weather. If you’re planting in autumn, you may only need to water your tree a little. We also stock a range of irrigation kits, suitable for a variety of planting schemes. Once planted, keep the area free of competing weeds and grass for the first couple of growing seasons. Using a glyphosate based weed killer or installing mulch matting will aid in this. Do not simply mow the grass around the area as this will only encourage it to grow more vigorously. If your area is prone to rabbits, we would advise using a rabbit guard. Monkey Puzzle trees do not require a lot of pruning. Simply remove any dead, diseased or awkwardly placed branches as and when you see them.